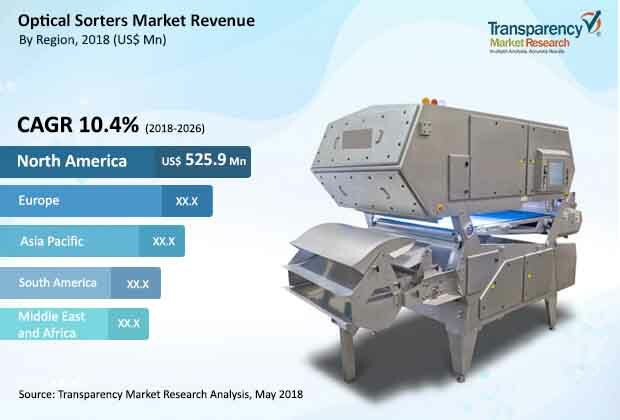 The global optical sorters market was valued at US$ 1,368.1 Mn in 2017 and is projected to expand at a compound annual growth rate (CAGR) of more than 10.0% from 2018 to 2026, according to a new report published by Transparency Market Research (TMR) titled “Optical Sorters Market – Global Industry Analysis, Size, Share, Growth, Trends, and Forecast, 2018–2026.” Cost reduction and increase in productivity through automation, growing labor costs, and stringent government regulations pertaining to food safety are primary factors that are expected to boost the market during the forecast period. For instance, automation technologies and solutions are being implemented in numerous industries to eliminate human error, minimize energy consumption, for product quality consistency with cleaner energy, and for efficient data collection and consolidation. Increase in productivity and speed with automation results in shorter delivery time and efficient business operations. Industries such as food, mining, and recycling are witnessing significant adoption of various types of optical sorters for optimized operations. Optical sorters are the result of integration of various advanced and sensor based technologies including high resolution cameras, Near-infrared (NIR) spectroscopy, laser, Shortwave Infrared (SWIR), X-ray, and Biometric Signature Identification (BSI). These technologies provide optimum precision, efficiency, and speed compared to traditional sorting technologies. Nonetheless, prices of such technologically advanced machines are significantly higher which impacts their use in many industries particularly small and medium enterprises. In terms of end-use, the optical sorters market is segmented into food processing, tobacco processing, waste recycling, mining, and others. The waste recycling segment is expected to expand at a significant CAGR of approximately 11% during the forecast period. However, the food processing segment is anticipated to hold a prominent share of the market during the forecast period. Growth in demand from consumers for high quality food products, and stringent government regulations pertaining to food safety and food quality are some of the major reasons for revenue generation from the food processing segment. The market in North America is expected to expand at a considerable CAGR during the forecast period. The factors contributing to the expansion of the market in North America are rise in merger and acquisition activities and significant growth in adoption of optical sorters in waste recycling plants. For instance, in June 2017, Penn Waste, Inc., a Pennsylvania, U.S.-based commercial and residential waste recycling and removal services provider, introduced NRT MetalDirector and NRT optical sorters in its materials recovery facility (MRF). The new system integration will improve output material purity and throughput to more than 45 tph (tons per hour). Penn Waste is one of the early adopters of Max-AI technology of National Recovery Technologies, a company that uses artificial intelligence to detect non PET (polyethylene terephthalate) items from waste. TOMRA Systems ASA, Buhler AG, Key Technology, Binder+Co AG, and Satake Corporation are some of the major players operating in the optical sorters market, profiled in this study. Various companies are establishing partnerships, and are carrying out strategic expansions to enhance their optical sorters offerings worldwide. For instance, in February 2018, one of the leading providers of collection and sorting solutions, Tomra Systems, signed an agreement to acquire 100% shares of BBC Technologies. BBC Technologies specializes in the design, development, manufacture, and installation of sorting, optimizing, and packaging solutions. The acquisition will further boost Tomra’s market position in sorting, grading, and packaging solutions for packaged, processed, and fresh foods.